Sen. Creamsicle (D-ND) rails against subsidies to the litter rake industry. 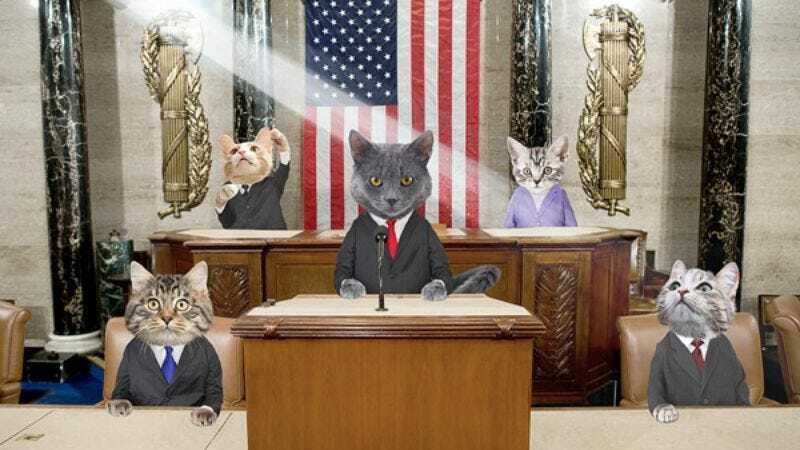 WASHINGTON—The current session of the 111th Cat Congress was once again suspended Tuesday following the sudden introduction of a sunbeam onto the Senate floor, a development that has left a majority of transfixed lawmakers unable to move forward. The ray of sunlight, which first appears in the official record at 11:30 a.m., interrupted debate over S. 391, a proposal to provide underprivileged felines with universal access to scratching posts. "We've come up against an unforeseen circumstance, but we'll resume deliberation and voting as quickly as is reasonably possible," said majority leader and Budget Committee chaircat Sen. Creamsicle (D-ND), stretching out to his entire length and repeatedly kneading the chamber carpet. "I think I speak for most of my colleagues when I say that, while it is extremely important we continue the legislative work at hand, we must first give this warm and bright beam of light the due consideration it deserves." "And we should, er, debate this for as long as it takes," added Creamsicle, softly swishing his tail back and forth. "Perhaps all day, if we have to." A majority of senators seemed to agree with Creamsicle. Eighty-nine of the 100 congresscats present immediately joined the new Sunbeam Investigative Committee, and a number of subcommittees are also reported to have been created, the largest of which has been tasked with determining the value of lazily batting at rising dust motes while half-asleep. A small minority of feline senators, however, took issue with the procedural delay. Sen. Poppy (D-DE) was especially vocal, claiming that the Senate should ignore the seemingly intractable sunbeam issue and continue with other, more pressing matters. "This irresponsible stoppage is absolutely unacceptable," Poppy said. "Frivolous distractions like these are robbing our constituents of the soft, cozy shafts of…I mean, the reforms they so desperately need…so desperately need… I yield my remaining time." Some legislators refused to participate in the debate altogether, most notably Sen. Ruby (R-SC), who spent several hours sitting motionless in front of the northwest wall of the Cat Capitol Building, staring unblinkingly at an unknown object. The sunbeam marked the fourth event to suspend congressional activity this week. According to sources, other disruptions included a thunderclap on Monday that instantly adjourned proceedings; Wednesday's chaotic introduction of a laser pointer; and the discovery of a large cardboard box in the Capitol Rotunda Thursday that prompted minority whip Sen. Tiddles (R-TN) to call a recess so that he could sit inside of it. None of these delays, however, compares to the appearance of a small sparrow outside the congressional chamber last month, which completely mesmerized House Speaker Jeffy-Boy (D-CA) and brought all government activity to a standstill for approximately 17 minutes. Big Stripey, founder of the influential political watchdog committeelitter.com, said he isn't surprised by the latest sunbeam debacle, claiming that years of corruption and mating scandals have shown just how ineffectual the current Cat Congress really is. "Our lawmakers were elected to serve the common cat, not their own self-interests," Big Stripey said. "With over 6 percent of the population stray, millions more going hungry or only getting dry food, and the dogs next door developing a very real litter of puppies, we need action now for the sake of our kittens and our kittens' kittens." "We're not paying these idiots to sit around and lick each other all day," Big Stripey added. Many congressional insiders refuted accusations of indolence, saying that the rigorous schedule of cat legislators entitles them to periodic breaks in addition to their 18 scheduled hours of sleep per day. "Our Founding Toms understood that certain provisions must be made in the interest of the public good," congressional spokescat Georgina said. "Democracy is not always so cut and dried. Sunbeams are going to happen. Vacuum cleaners are going to happen. Those little springy wires with a piece of cardboard at the end are going to happen. It's simply the way the system works." According to late reports, the Cat Congress had briefly reconvened due to cloudy weather, but was quickly adjourned again after a crumpled up piece of aluminum foil suddenly rolled across the Senate floor.